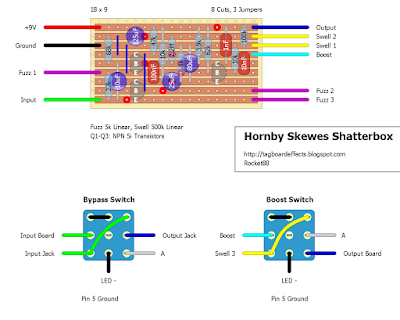 Skewes Shatterbox Produced in Leeds circa 1966, the unit combines two effects; The JHS Zonk fuzz and a Treble Booster circuit, the original unit was produced in exceptionally limited numbers and was famously used by Mark Bolan T-Rex. Uber Rare Way Huge Purple Platypus Octidrive only about 120 or so made. Essentially, this is a Red Llama Overdrive and an octave effect similar to the Green Ringer. A very specialized pedal, its best use is to push your already driven amp into fuzz while doubling up on the upper octave. Discontinued way back in the late 90's, and no reissue set for release. I will add one more thing. 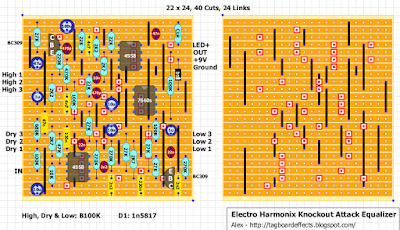 On the schematic from over at FSB there's a 27k resistor that seems to go nowhere coming off Drive 1. 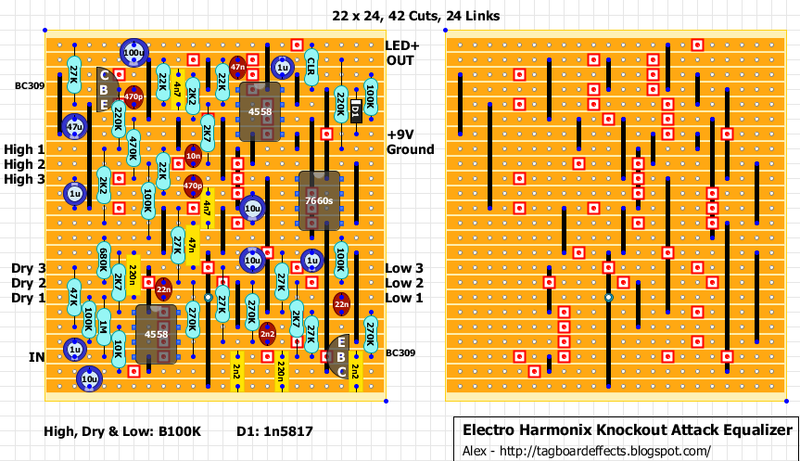 I've looked over the PCB a million times, and despite the thought it has to go somewhere I'm certain it's a dead end. Maybe to make a possible tracing more difficult. Here is a layout for the BYOC Crown Jewel (minus the boost). 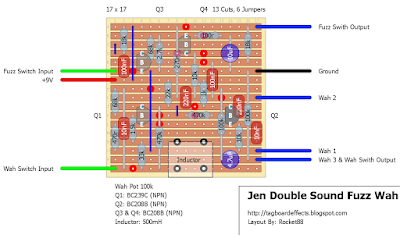 The boost is an independent circuit of your choice in serie with the main circuit. There is also an extra switch to select if you want the boost "Pre" or "Post" the main circuit. 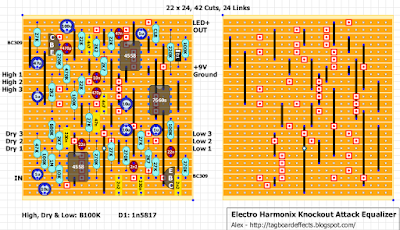 You can find all infos and schematic on their website here. A modified Ross Compressor. Two simple controls sustain and level. Unfortunately, I haven't been able to find a video for the MKI, but as we all know if it's been modified by Mr. Huge it's going to sound great. Note: There's a cut under D3 to the left of the 1nF cap that's hard to see. Once again, not much info on this one, but was made way back in '92 and for a limited run. It's a booster that's more of a midboost/cocked wah tone. 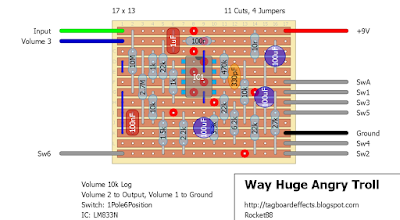 Unfortunately, there's 0 videos I could find of it, but once again if it's a Way Huge pedal it should be awesome. What's interesting is that it's really just an Anderton Frequency Boost. 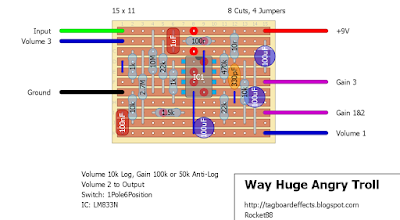 Note: You can change the 2 22nF caps to one of the other value options from the Super Tone Leper if you choose to change the frequency of the boost. 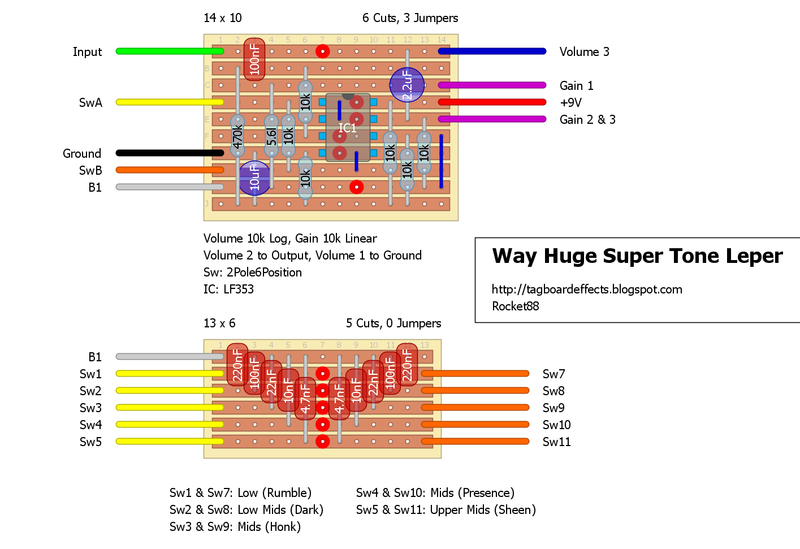 Figure while I was at it I might as well do a layout for the Super Tone Leper that Mr. Huge had made for Queens of the Stone Age back in the day. Same effect, but with 5 different frequency selections. 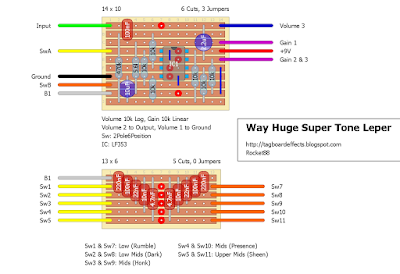 One more layout with the additional cap for the frequency selection caps. 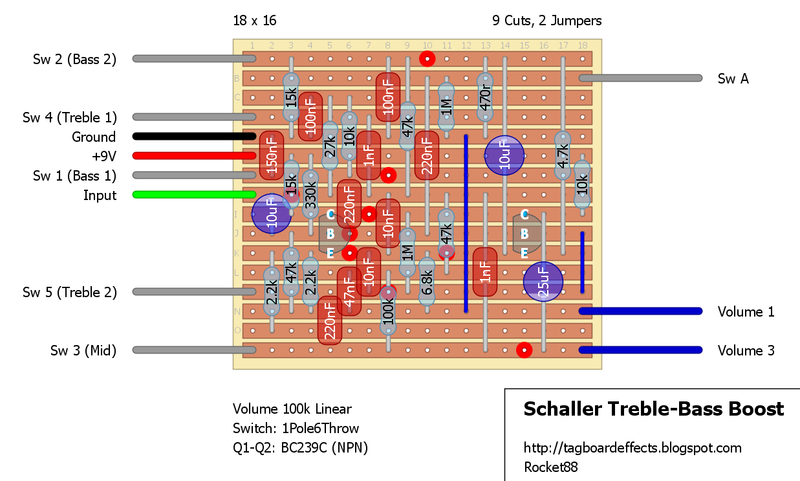 I added a pair of 3.3nF for a treble setting like Ryan suggested below. You can obviously mess with the caps and find those that you prefer. I was just reminded of this one on FSB and although there are already vero layouts available, I thought it was worth adding to the library for the sake of completeness. Positive ground so watch the daisy chaining or try the voltage inverter. "This circuit is a little different to a stock Buzzaround. You can still nail those Crimson tones with ease but this Buzzotron circuit will give you a little extra extension of frequency range and a little more of a tailored fuzz tone. The hand selected original transistors will have very much the same character and tone of the original pedal. Giving you great tonal break-up and control from truly ear splitting high gain to garage-y overblown decay!" 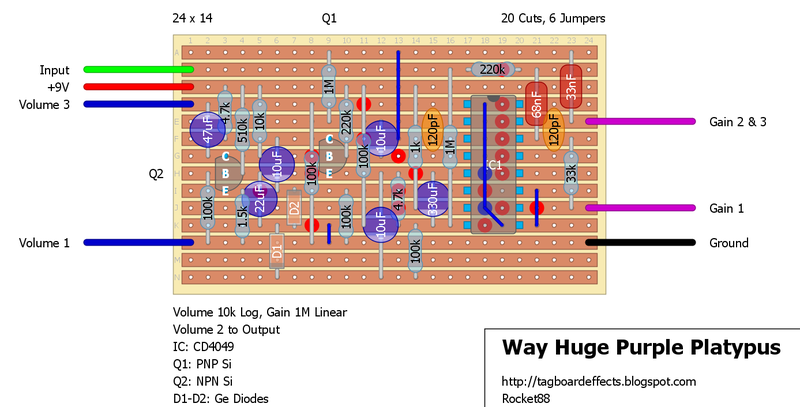 So I randomly stumbled across the schematic for this one over at FSB and as always thought it would be a nice addition. Just like any other Way Huge pedal I think it sounds badass. 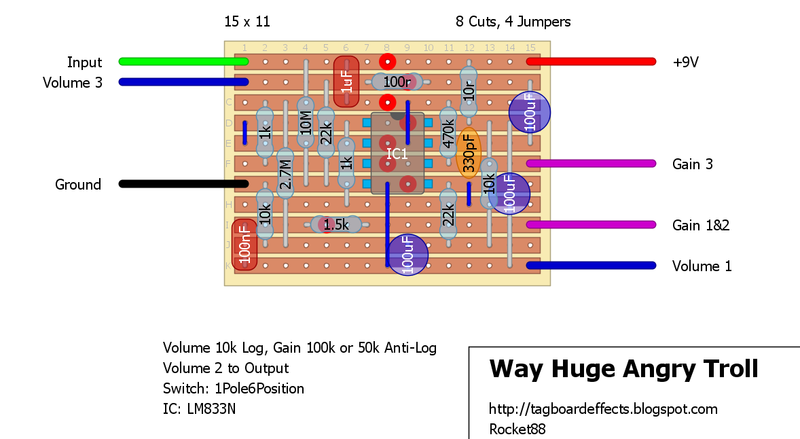 The mighty Angry Troll Linear Boost Amplifier from Way Huge Electronics serves up generous portions of volume and gain to pummel the input of your amp with up to +50dB of gain. It adds bite and punch while transforming your mild mannered tone into a beastly sonic onslaught! The Angry Troll's two controls interact like a vintage mic pre amp. 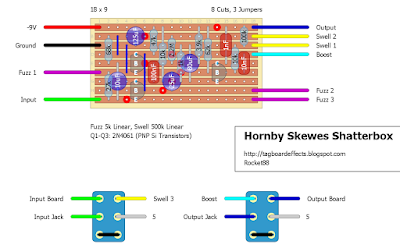 The Anger knob-a rotary switch with six Fists of Fury positions-adjusts the amount of gain created by the Troll's op-amp, while the Volume knob regulates the overall output level. High grade components are used for a precisely tuned circuit that works like an extension of your amp. Another tone monster from the mind of Mr. Huge! Layout 2: Was kinda requested below. Modded to remove the fist switch, which controls the gain, and replace it with a pot. Quick note about this is that the way the switch is wired when it's at position 1 it has the most resistance allowing a clean tone. according to my calculations at Sw1 there should be 62.5k resistance, and since there's no 62.5k pot you could use a 100k or 50k pot. 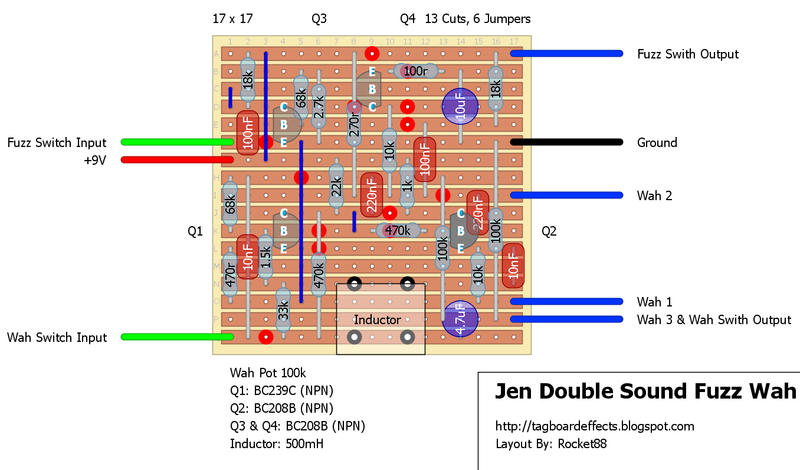 Nice thing about doing this is the board shrunk, all pot wires are connected to the board, will give more options for grit, and it should be a stupid simple build. Not much info on this but, it's a rare West German Schaller vintage “Treble-Bass Boost” from 1968. It typically goes for over $400usd, so fairly desirable. 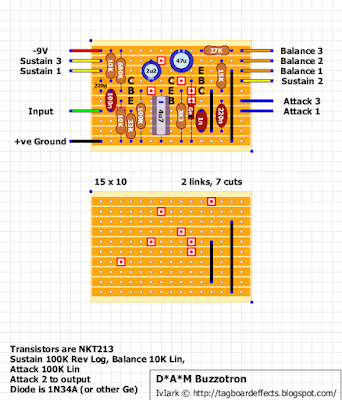 It's a 2 transistor based booster, with a five position switch that controls the the frequencies being boosted. There's 2 treble settings, 2 bass settings, and 1 mids setting. Seems like it also gives a little bit of drive too, which is a nice addition. 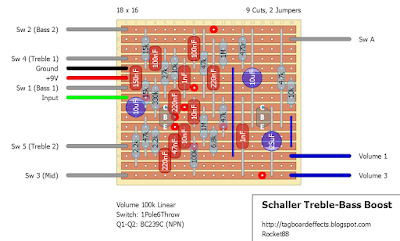 "The Knockout is a powerful two-filter combination that can make your Les Paul sound like a Strat and your Strat sound like a Tele. Its secret...the Knockout has a 7 pole filter for sculpting the low end of your mids and a 6 pole filter to shape the top end of the mids. This provides incredible tone shaping. Use after distortion to bring out the heavy weight punch of the metal masters. The Knockout is also truly amazing on Bass." 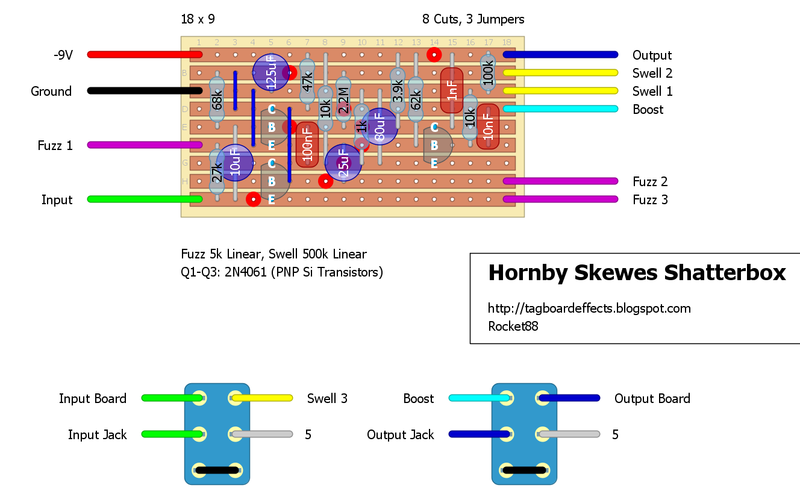 John Fogerty's fuzz sound in a box. 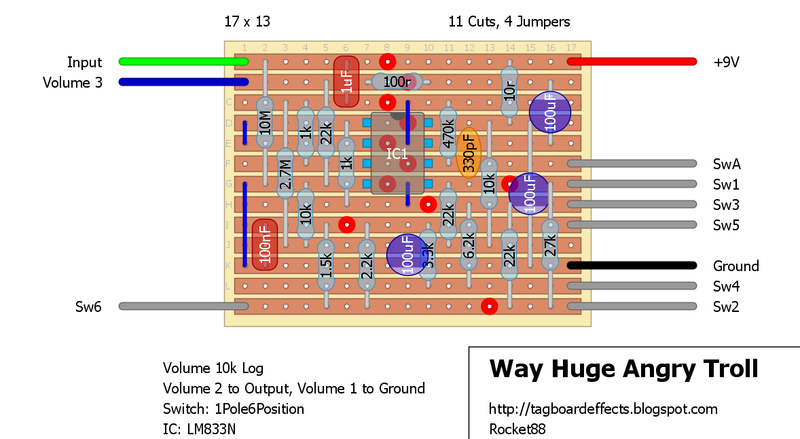 Can find original thread, schematic and sound clip here. The Colorsound Fuzz-Wah, or to be exact the Colorsound Wow-Fuzz! A new version of a funk-tastic old timer. The original 1970’s two transistor silicon distortion stage delivers the fuzz and the classic inductor based Colorsound wah circuit gives you the wow! 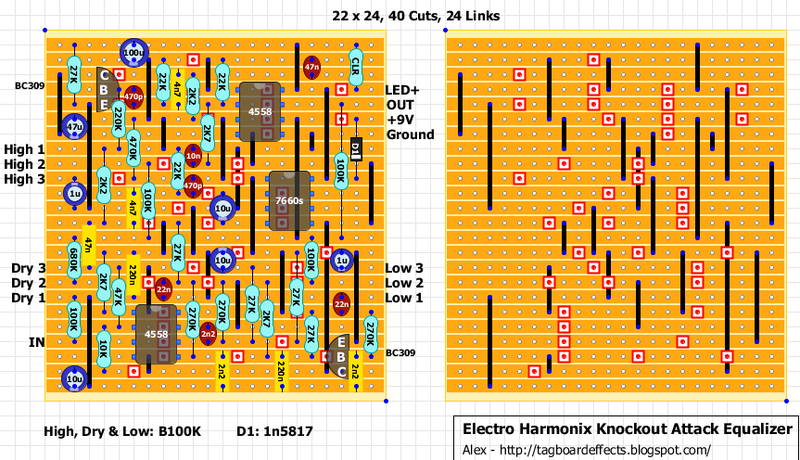 Ah, the inductor based circuit you say. Been awhile since Colorsound did that, right? That’s right and who better to achieve time machine like accuracy on such a wah circuit than monsieur Castledine of Castledine Electronics fame. 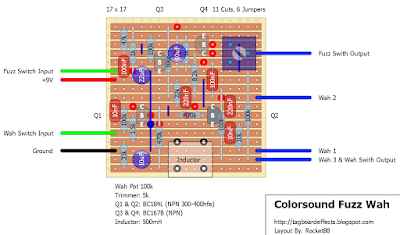 From the reproduction circuit board to the custom wound vintage specification inductor, this is a genuine and bona fide Colorsound wah in everyway. The huge soaring sweep, highs that level mountain tops and low mids that sink ships. Fast reacting prono soundtrack like cool, nothing chukka-wah’s like a Colorsound. 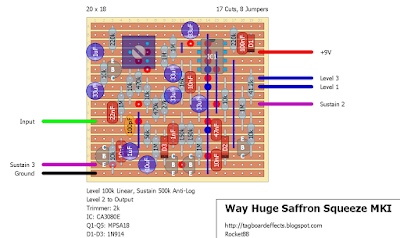 Buddying up along side this specially falvoured wah circuit we have the authentic fuzz stage as featured in all the early Colorsound Fuzz-Wah’s. Voltage feedback family ahoy. 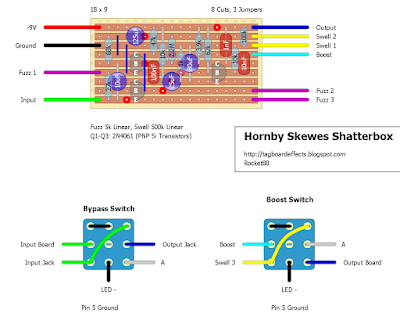 This transistorized silicon fuzz circuit is biased for a smooth and mellow fuzz tone. Rich with heavy density that gels perfectly into the wah stage once engaged. 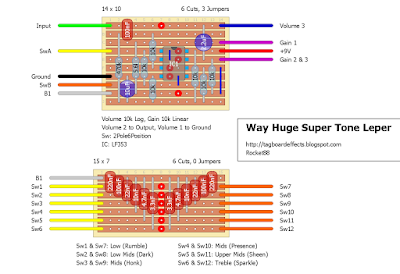 Independently switchable stages. In other words one switch to engage each circuit. It may seem a little odd at first having both mounted at the front of pedal but it does work surprisingly well indeed. After a little bonding session with the pedal it becomes quite easy to select the circuit you desire or even engage/disengage both simultaneously. It is most certainly not rocket science but a little introductory time is never a bad thing. 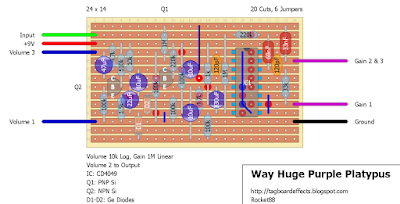 You want to use DPDT switches to turn each effect on and off, unless you're going to put LEDs in to see what's on and off, and the wah comes first in the circuit. 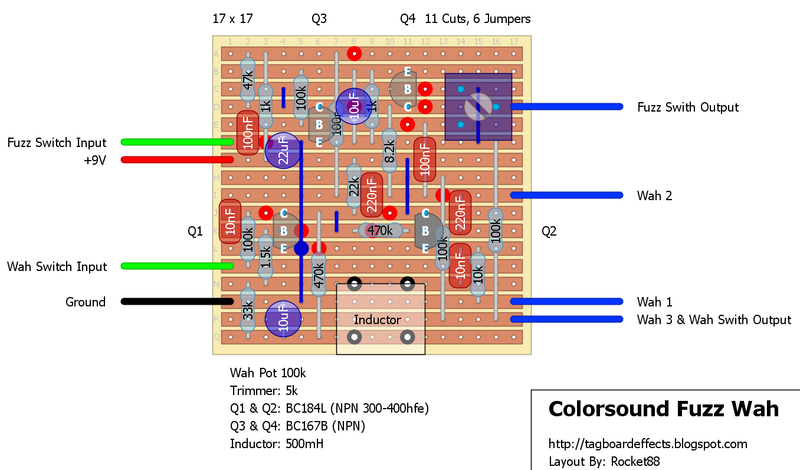 A quick note: The original transistors have a pinout of BCE top to bottom on the flat side, but since they can be rather pricey these days I decided to make the layout using the more common CBE pinout. So if you decide to hunt down the original transistors be aware that you will need to twist 2 of the pins. Not a big deal, but can be kind of annoying for those of us that are a little on the meticulous side. Also, the description I posted is for the Sola Sound reproduction made by the captain. He switched the 5k trimmer to a 47k, so you can put a 50k no problem. 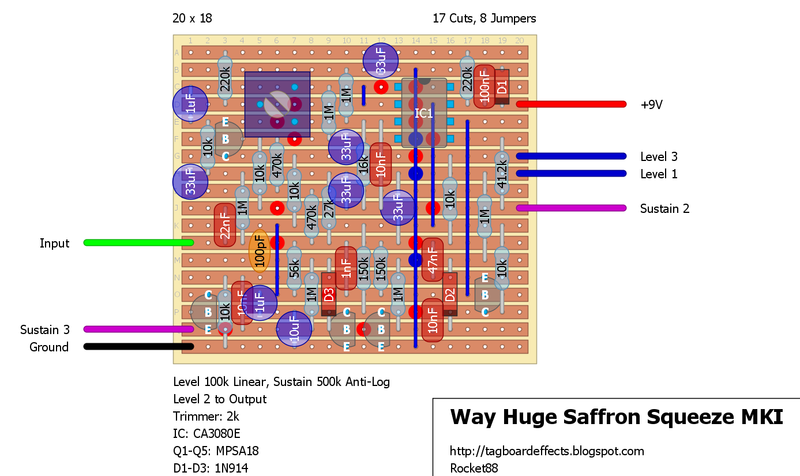 Mictester's version of the Big Muff. 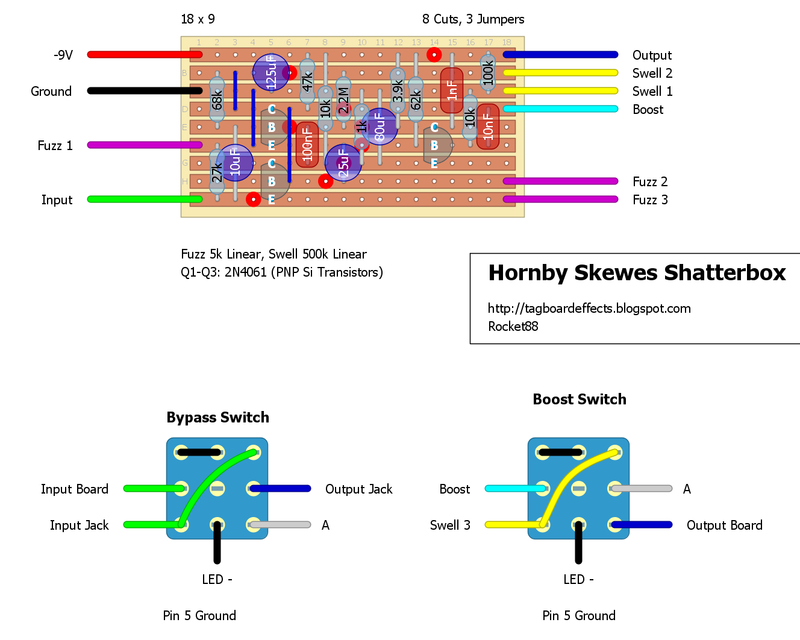 I've used the updated schematic on page 2.